AFPSAT Results July 2017 | Cabatangan, Zamboanga & Isabela, Basilan - Exam News, Reviewer, Military Career, & Everything [MN] . . 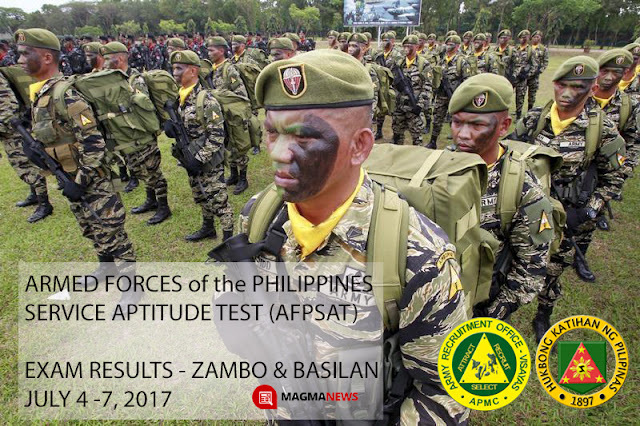 The Army Recruitment Office Zamboanga branch released the results of the Armed Forces of the Philippines Service Aptitude Test (AFPSAT) which was conducted at Cabatangan, Zamboanga & Isabela, Basilan military testing centers from July 4 to 7, 2017. The result was posted by Army Recruitment Office Zamboanga through their Facebook page on July 31, 2017.